Aberdeen Scotland vs. Aberdeen New Jersey: Where Is Best To Live & Work? Last week, Donald Trump stayed in New Jersey as part of his “thrifty” weekend. According to the US Census Bureau data, New Jersey is not only one of the most expensive U.S states but also the 2nd richest state, with a median household salary of $84,720 (£65,661). However, the state is also ranked 10th on the highest state and local tax bands. New Jersey is home to the city of Aberdeen. We wanted to find out which Aberdeen is the best place to work in, and live in: Aberdeen, Scotland, or Aberdeen New Jersey? The findings will be used to determine career path, wealth and the overall happiness scale in each city, and compare the two. Careers in professional occupations in Aberdeen, Scotland increased from 14% to 20% between 2001 to 2011 with a rise in the field of science, research, technology and engineering. Careers in agricultural, manufacturing and skilled-related trades decreased. Careers in the wholesale and retail trade, repair of motor vehicles and motorcycles grew by 19% between 2001 to 2011. The number of persons in mining and quarrying increased by 18% in the years of 2001 to 2011 and the numbers of female workers in the industry increased from 4.6% in 2001 to 5.3% in 2011. But in 2016, people working in the industry decreased again when Aberdeen saw the biggest drop in wages within the sector. The number of individuals with professional qualifications increased by 63% from 2001 to 2011. Persons with no qualifications decreased by 9% over the same period of time, and overall, all high education qualifications for people aged 16-74 increased over the 10 year period. 12.8% of careers in the Aberdeen city area are based in human health and social work activities. The number of people in employment grew from 2001 to 2011 by 14%. The number of people not in employment fell by 4%. In the most recent update, Aberdeen City gov recorded that unemployment stood at an estimated 5.2% between July 2015 and June 2016. In February 2017, Aberdeen Township recorded an unemployment rate of 4.4%, which is 0.3% lower than the national average. Aberdeen, New Jersey’s 2015 census records its residents as mostly employed in the fields of business, science and arts, specifically financial management, computer engineering and education training-based roles. Office based, sales-led roles are also becoming increasingly popular within the city and state. In 2016, being an accountant meant you had the world’s safest job. In direct contrast, being a construction worker meant you had the world’s most dangerous job. In this section, we look at which industries caused the most fatalities and how much average salaries were within each field. The U.S Bureau of Labor Statistics reports that trade, transportation and utilities had the highest number of recorded fatalities in 2015 across the US, and the most deaths were seen in truck transportation. In the same year, the study showed that the state of NJ had one of highest employment levels in this occupation (The town of NJ covers Monmouth County,where the town of Aberdeen sits). The average hourly rate for truck transportation drivers in NJ is $23.96 (£18.58). Across the US, the construction trade saw the second highest number of on-the-job fatalities, specifically in specialty trade. Salaries for general construction in Aberdeen, NJ averaged around $15.17 (£11.76). Natural resources and mining were in the top 5 industries of jobs that caused fatal injuries. In 2015, the Health & Safety Executive report recorded the most fatalities across Great Britain happened in the field of construction where there were 43 fatal injuries to workers. The second highest number came from services, which includes (but is not limited to) transportation, cleaning, banking, insurance and education. Surprisingly, in 2016-17, the number of fatal injuries to workers in services surpassed the number to those in construction, potentially labeling services as the UK’s most dangerous. This is also an indication that the services industry could have a larger number of workers than any other industry in the UK. Aberdeen City has the highest median hourly income out of all local authorities in Scotland. Construction workers receive approximately 6% more in hourly pay than those in Aberdeen, NJ. However, those working in transportation (including truck drivers) receive approx. £11.95 an hour, which is 36% less than those in NJ. Aberdeen City council reports the average household income in Aberdeen City (2015 – present) is £28,600. Aberdeenshire is £29,600, higher than the Scottish average of £24,700. In the same year, median household income in Aberdeen, NJ is $84,720 (£65,661) – a difference of 131%. It should be noted that singles households in NJ had a median income of $35,000 (£27,114) to $49,999 (£37,952) and couple or family-based households had a median income of $100,000 (£77,437) to $149,999 (£115,320). Fun fact: There are over 30 Aberdeens in the world, and 6 of the cities are based in the US. 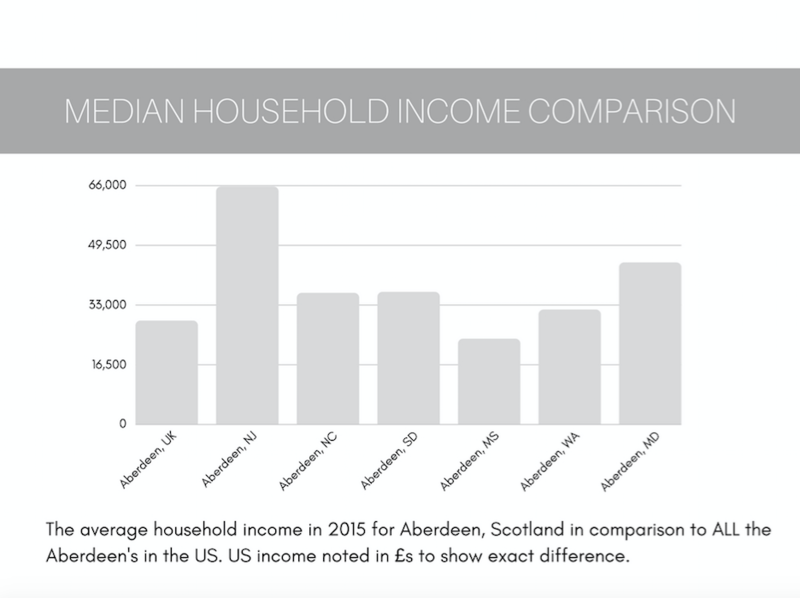 In comparison to all cities named Aberdeen in the US, we found that Aberdeen, Scotland have the 2nd lowest median household income. Aberdeen, Mississippi have the lowest income at £23,595 ($30,357). To get a better financial outlook, Aberdeen, NJ house prices in 2015 were $287,884 (£222,129) on average. In Aberdeen, Scotland 2015 house prices for a semi-detached home was £340,718, and £161,416 for a flat. In 2016, the team at London School of Economics put together results from their wellbeing survey. On average, people are happier during national and festive celebrations. The survey concluded that having more public holidays contributed to a country’s overall wellbeing. 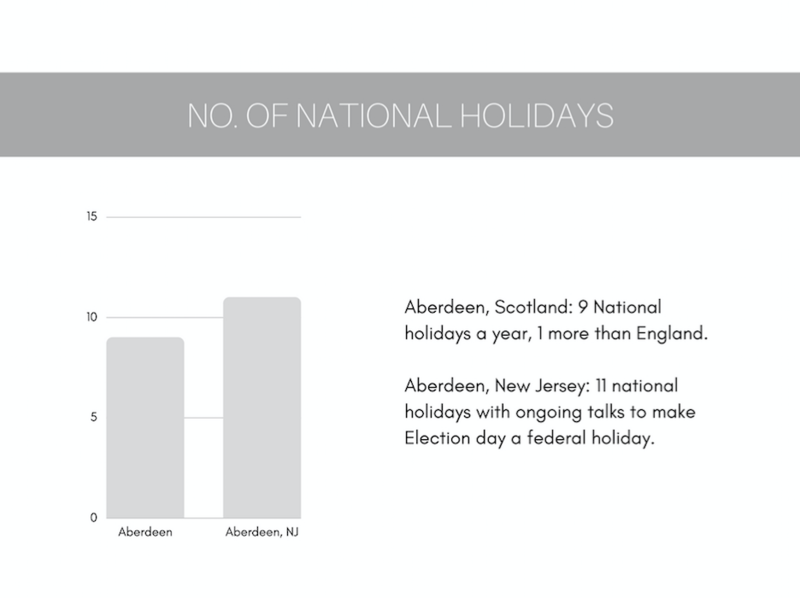 Residents working in the public sector in Aberdeen, NJ receive 2 national holidays more than those in Aberdeen, Scotland. However, almost all workers are legally entitled to 5.6 weeks paid holiday a year in the UK, whereas in the US there is no legal minimum and it’s usually at the discretion of employers. It’s been noted that private employers in NJ allow 6 paid days leave. Aberdeen, Scotland is 1142% more densely populated than Aberdeen, NJ, with projected population rates to reach 267,963 by 2019. Residents in NJ are approx 9 years older in age than those in Scotland. Disposable income would average out the same as per capita does not reflect other expenses. It is cheaper for those in Aberdeen, NJ to buy a property than it is to rent a property. The cost of living is more expensive in Aberdeen, NJ, mainly due to housing, health and groceries. It’s clear to see that, of the two cities, Aberdeen, NJ is most prosperous in wealth as residents are moving into sales-based roles to earn more. Those who are working in dangerous jobs such as the transportation trade receive above average salary compared to the rest of the states. This could be largely due to NJ being close to New York, where demand for goods and goods being delivered on time is compensated for. Residents in Aberdeen are moving from old-world industries such as agriculture and manufacturing into high-skilled professional careers such as finance, engineering and science. People are working more hours than they did 10 years ago. However, as trades such as vehicle repair and hospitality pay the less than the Scottish median, it’s not likely to meet the wealth status of those in NJ any time soon. It’s encouraging to see that occupations in human and social work continue to increase, and this area saw the highest increase in hourly pay (excluding overtime) in the past year. The mining and quarrying industry shows a large decline in comparison to other industries. Manufacturing, forestry and fishing, however, all show the biggest decline. Professional expertise and the rise in professional engineering could mean significant development for Aberdeen’s energy, oil and gas industries as they head toward new technology and natural alternatives. In fact, we’re seeing this in action – earlier this week we heard that Kishorn Port will have its first work carried out in over 23 years. The dock will be used to construct the Kincardine Offshore Windfarm project, a renewable energy scheme said to be one of the world’s largest floating offshore wind farms. The wind farm will be built nine miles outside of Aberdeen and will no doubt create demand for technical engineering and construction roles. We found that Americans tend to work more hours due to the lack of legal requirement for annual leave, therefore we assume overall work morale (specifically when it comes to blue collar jobs) to be lower than that of workers in the UK. It seems happiness and chasing happiness in the workplace means two different things to both cities. We are clearly seeing people moving towards jobs and careers that are financially superior and/or personally enriching in both cities, but more so in Aberdeen, Scotland. More articles like this in Press Releases by HIJOBS.